Be Safe This Labor Day Weekend! Even though the weather in Florida does not show it, summer is coming to an end. This Monday is Labor Day, and families and friends across the country will be gathering together over the long weekend to say goodbye to summer. Most people think of Labor Day weekend as their last chance to take a vacation, visit the beach or even just grill outdoors. The following safety tips can ensure that you have safe and fun Labor Day holiday. Always have an emergency kit in your vehicle that contains flashlights, extra batteries, jumper cables, bottled water, a tool kit and a knife. Tell someone who is not travelling with you about your travel arrangements. That way someone knows where you’re going, how long you will be away and what time you will be back. Fasten your seatbelt! Make sure everyone in the car properly fastens their seat belts, and small children remain in their appropriate car seats. Never drink and drive. Figure out a safe alternative home before you go anywhere. Check the weather and stay away from water during a lightning storm. Don’t swim alone. Children should always be supervised by an adult when playing in or around water. Emergency floatation devices should always be readily available. If taking your boat out, you should have enough life jackets for everyone on board. Refrain from consuming alcohol while boating. You can be arrested for driving a boat while under the influence of alcohol. 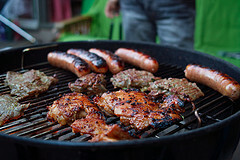 Make sure your grill is set up in a safe location, away from houses, trees and any other flammable objects. Do not add charcoal starter fluid after you have already ignited the coals. Wear gloves when grilling foods to prevent burns and always handle food in a safe manner. This Labor Day, the Pasco County Injury Lawyers at Whittel & Melton want all the hardworking men and women in the community to enjoy a safe and happy holiday. Should you become injured, we can help you get back in the groove of your daily routine. Contact us online or call 727-847-2299 for a free consultation. Happy Labor Day from Whittel & Melton. Be Safe!